The Allston store has been CLOSED and MERGED into our BROOKLINE store, one-half mile down the street at 316 Harvard St. (Arcade Building) in Coolidge Corner. Please visit us there! Note: all customer in-store subscriptions have been moved to Coolidge. New England Comics has decided to consolidate its Allston store into our larger location in Coolidge Corner, Brookline, which is just a half mile down the same street. This means that 'NEC-Allston' has CLOSED as of October 28th, 2015. Existing Allston in-store subscribers will have their subs switched over to our Coolidge store at this time. If you wish to transfer your sub to a different store this can easily be arranged. Just contact us at our Coolidge store, 617-566-0115. We appreciate the business of everyone who has shopped with NEC in the Allston store over the many years and we look forward to seeing you at our Coolidge Corner store. If you have any questions relating to the Allston move please discuss this with our Allston staff OR feel free to contact General Manager Tom Yee at 617-770-1848 or Senior Manager Hannah Stevens at 617-354-5352. 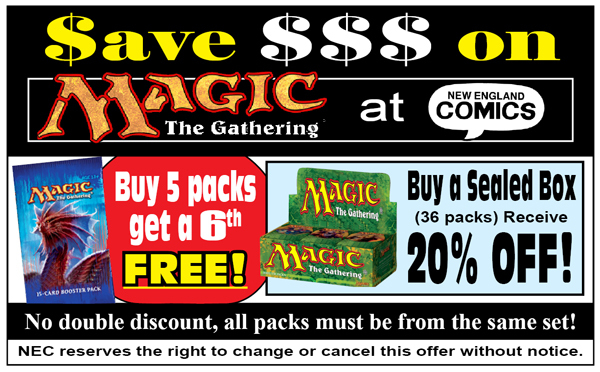 Note that this change has no effect on any other NEC store!